For a start it is worth being defined with biodiesel definition. This biofuel is based onvegetable or animal fats (oils), and also products of their etherification. Etherification is formation reactions of esters as a result of acids and alcohols interaction. Talking about biodiesel, we touch upon more extensive subject of biofuels. It is very difficult to talk entirely in one article therefore in the near future it will more articles based on this topic. Roughly talking, production of the biodiesel presents process of methyl alcohol and vegetable oil mixing, previously cleared from impurity. Alkali acts as catalyst of such process. Process proceeds when heating mix reaches 50 °C. Next mix is cooled and settles. As a result receive two fractions: the biodiesel (methyl air of oil) and glycerin which in the subsequent can be used by production of the soap or other products. Process repeats several times. Soy, palm-oil, coconut oil could use as raw material. Instead of methanol sometimes could be use ethanol. To present production scales of the biodiesel, it is necessary to tell that from 1 hectare of crops or colza it is possible to receive about 1 ton of oil. For production of the biodiesel, it is necessary to take 1 ton of oil and add 110 liters of methyl alcohol. In some sources it is specified that from 1ton seeds of a colza receive 300 kg of oil that finally will allow to receive 270 kg of diesel biofuel. Now the biodiesel generally made in Biodiesel cavitation reactor. Application of ultrasound will allow to increase production efficiency to 99%. Biodiesel cavitation reactors will allow to reduce production cycle about less than 30 seconds (usually mixing process takes about 1-4 hours). The main thing that processing by ultrasound allows to reduce process of division into fractions about less than 60 seconds (at application usual mixing this process takes 5-10 hours). Also application of ultrasound allows to reduce number of the catalyst necessary for reaction honor for 50% thanks to activization of chemical activity in the presence of cavitation. As the conclusion it would be desirable to tell that the idea of environmentally friendly fuel isn’t the theory, and actively takes root into life, an example of that is use of the same diesel biofuel. Besides in the different countries searches new sources for biofuel are actively conducted. The most popular for today is the idea of receiving the biodiesel from algae. The biodiesel from algae won’t demand the big areas for crops, won’t be freeze at low temperatures and will be able to be used in aircraft and on fleet. Construction of experimental plants for production of the biodiesel from algae only confirms that researches in this area will proceed. 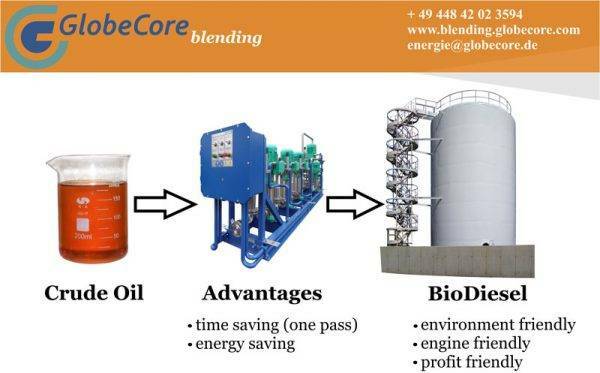 GlobeCore Blending company is intended in production of biodiesel cavitational reactors and biodiesel cavitation blending systems. Basic purpose of these installations is increase of production efficiency of biofuels and an intensification of dispergating processes, homogenization and emulsification of liuqid components which in the end result after processing form the steady fine mix, the received product has resistance to a long uniform period of storage and is steady against stratification. If you want to reduce expenses of you company for fuel production, “USB” cavitation blending system could help you to do that. To receive extra information contact us and technical manager will call you back or download inquiry list and receive free catalog.